Nintendo has once again made an add-on second Circle Pad for the 3DS. And, you know what, it's not half bad. Actually, it seems like the Circle Pad Pro for the XL could be pretty good. The smartest thing about the larger Circle Pad Pro is its design. It's not nearly as bulky as the original Circle Pad Pro, gradually jutting out for the second Circle Pad. This shaved design even has a ergonomic slope for you to rest your palm. It's a smart design on Nintendo's part, and it feels nice in the hand—comfortable, but not too big. "Not too big"—that's funny. The 3DS XL is big; that's the point. It's big, which is something gamers who dislike the original 3DS's size will probably appreciate. 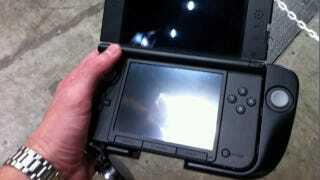 Like the regular Circle Pad Pro, the backside of the new add-on shows exposed screws. The plastic is still hard and feels cheap—Nintendo continues to ignore soft touch plastics. While the shaved design of the new Circle Pad Pro shows Nintendo is thinking about how to make this peripheral more comfortable to use, it's a shame that Nintendo hasn't figured out how to improve things like basic presentation. Also, like the original Circle Pad Pro, this XL version is light. This is a huge asset for the new add-on, as I don't imagine players will feel tired using it. The button layout for the larger Circle Pad Pro is similar to its earlier, smaller incarnation. The shoulder buttons, however, feel slightly smaller. I honestly do not know if this is merely psychological or if they are indeed smaller. The most interesting thing about this new, larger Circle Pad Pro is that it feels compact, yet still usable. And more importantly, while Nintendo says the 3DS XL isn't big enough for a second analog stick, the new Circle Pad Pro's smart design gives hope that one day it could be.